The Last Operative by Jerry B. Jenkins will make your heart race. This spy novel had me guessing from page one. Which do you prefer: mysteries or suspense? 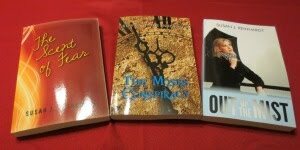 While I like a good whodunnit, the suspense books add an adrenaline rush. 5) Contest deadline: Saturday, May 26, 2012, at midnight. The winner will be notified by email. If you do not leave me an email in the comments and do not respond to the Winner Announcement on the blog by Saturday, June 2, 2012, another winner will be selected from the entries. I love Jerry's writing. Would really love to get this new book. My apologies. This was not supposed to run until May 23rd. I'm having problems with Blogger. I will add you to the giveaway list if you comment here. Happy Blogoversary! I'll pass on this one; I have it already and haven't read it yet. I think I need to! Thanks for the blogoversary wishes. Oooh, this sounds great, Susan! Happy Blogiversary, and please include me in the drawing. I love mysteries more than suspense--I don't like the stress! I'm reading Bonnie Calhoun's Cooking the Books right now, and it's a hilarious, well-written mystery. I would love to have the chance to read one of his novels. Thanks for hosting this giveaway, Susan! I like mystery better than suspense. Jeanette said it well. Hi Jen - Fair warning, this is an intense book with lots of action. Hi Melanie - Great to see you. Thanks for entering! i forgot to mention that i'm a follower, too. See you soon dear friend. My Mom and I laugh because we both get so engrossed in a book that we forget the time. I'm having Blogger problems. Their new and improved is NOT. Susan - just wanted to let you know that Karen Lange has a guest post up on my blog today. Hi Jess - I also like suspense. Hi Tyrean - I'll be over ASAP. Hey Miss Susan, I just wanted to pop over and thank you for visitin' with your comment and hoppin' on my blog. I sure hope ya enjoy the ride. Happy blogoversary to you sweetie!!! God bless and in the word of that whacked out Granny Clampett, "ya'll come back now, ya hear???" Hi Nezzy - Thanks for stopping by and commenting. I think Granny Clampett is a hoot! Hi Joy - Welcome, and thanks for commenting. Mystery or suspense? Is there a big difference? I never gave that a thought :) Well, you made me think today, thanks! Yes, there's a difference. Mysteries are mostly the whodunit variety. Suspense keeps the adrenaline flowing until its almost unbearable. Anyone have a different definition? I'll occasionally read a thriller, but prefer mystery/suspense. Hi Janette Dolores - This book is action packed. Your hubby would also like it since the MC is a man. Interesting comments, thanks everyone, thanks Susan! Thanks for commenting. It's nice to see you in the blogosphere again. I much prefer suspense to mystery/who dun it. I love that delicious tingling can't-put-it-down feeling when the author has really grabbed me with the characters and the fascinating circumstances. This book is action packed. Thanks for entering the drawing. Jerry Jenkins has such a fabulous imagination! What a great author he is. Hello, Susan! Thanks for stopping by my blog today and following me. Hmm... I like mysteries because you are engaged in collecting clues and putting all the pieces together and then left wondering if your conclusion is correct - it makes for a good read! I really like Jerry B. Jenkins's web presence. I haven't read any of his books, so I'll have to check this one out! Hi Gabrielle - Thanks for becoming a Follower. Playing amateur sleuth is a fun part of reading whodunits. Hi Alisa - I'll have to check out his website. I'm familiar with his work from the Left Behind series. I like both. A good mystery with lots of action! Happy Blogoversary! You'd like the action in this book.